FAST! 40cc 4-Stroke, single cycle engine,air cooling. Front & rear 4.10-6 tires. If you are in the market for a small, kid-friendly pit bike then the 4-stroke pit bikes are your best choice. 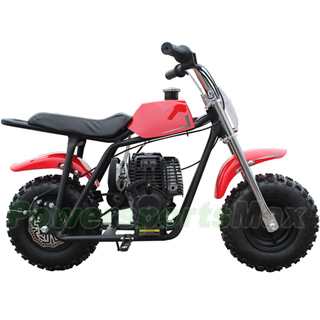 The small 4-stroke pit bikes are perfect for beginner use. However, it is also a fun bike for kids who already know how to ride and it would be a great foundation for a pit-racer or backyard-track bike. It is a TON of bike and performance for the dollar. Shipping charge for one single unit of DB-Z004 is $99.95(Please login to see real shipping charge for these states: Florida, New York, District of Columbia, Connecticut, Maine, Maryland, Massachusetts, Montana, New Hampshire, New Jersey, Pennsylvania, Rhode Island, Vermont, West Virginia, Delaware, etc.) , and you will get discounted shipping price if you order multiple item. Great bike excellent speed. Easy start very fun! Got this for my son as a birthday gift and he loves it very nice good quality. Thumbs up for a great time. Easy to assemble and arrived on time. Its not a $1000 dollar pocket rocket, but for the price my kids and i had a great time. Well probably buy another one as soon as my 4 yr old gets the throttle dialed in. Got this for my son for Christmas and he absolutely loves it!!! It shipped on time and came in perfect condition.